Who Do I Want To Please? 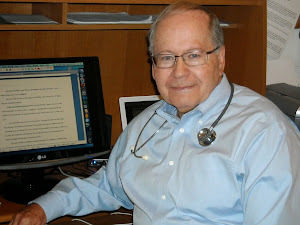 When I was practicing medicine, I felt I had a number of responsibilities. First and foremost, of course, was the patient. I wanted to get the diagnosis right, institute the proper treatment, and restore health ASAP, without causing any complications. And I managed to do just that...almost all the time. But doctors are human, and there were probably times when I was a bit slow to get the right treatment started or went another route, arriving at a satisfactory conclusion but probably not as quickly or smoothly as if I'd chosen another approach. Besides all that, of course, there was my responsibility to the patient, to his or her family, to the people with whom they worked (you know--get them back here as soon as possible), to the community (sorry--your dry cleaner is closed today)... You get the picture. Now that I'm retired from medicine and writing full-time (or as full-time as retirement permits), you'd think my responsibilities would have diminished. Sorry to say, they haven't. Now I have to please my editor (and usually there are two or three involved before it's all over), the reviewers, the readers, and on and on. But if I find myself trying to please everyone, I'm much like the rider who jumped on his horse and rode off in all directions at once. Not only does the end product suffer, the result of writing that tries to please everyone doesn't sound like me. What I've tried to do--and I don't always succeed--is remember how I got into writing in the first place. God placed a very specific burden on my heart to write a non-fiction book about the loss of my wife. I did that, and that book continues to minister, many years after its publication. Then, through a set of circumstances that can only be referred to as a "God thing," I got into writing fiction, and was eventually published. But if I deviate, if I find myself writing to please a particular segment, if I wake up at 4 AM worrying that a line in my latest book won't sit well with a prominent author who has promised an endorsement, I've lost my focus. That's when it's time to refocus--on the One who got me here in the first place. That's who I need to please. In your life, are there people you have to please--at the office, at home, even at church? Do you find yourself going off-course to please them, even if it requires being just a bit hypocritical to do so? I do. How about you? I’ve been privileged to meet with a number of book clubs—from those centered around neighborhoods to church groups to gatherings in a retirement home to phone conversations with groups meeting several states away—and it’s always a treat for me. Likewise, the members seem to enjoy interacting with a “real author,” although it’s still hard for me to consider myself in that category. What are the benefits to readers of being a book club member? I can think of several. You interact with others who share a love of reading. You get another viewpoint of the books you read. And you’re encouraged to read outside your usual comfort zone. What about authors? Aside from building your reader base, discussing your books often brings up points you might not have considered when you wrote them, points that add depth to future books. Besides that, you get to play celebrity, and that’s always nice. Now I’d like to introduce you to Nora St. Laurent, who, with her husband, Fred, founded The Book ClubNetwork. Here’s what Nora says about it. “The Book Club Network was born out of a desire to share Christian Fiction authors with other book clubs, share book club ideas with other leaders and to encourage the authors who are writing such amazing books… It’s a place to find where a book club is located. We have a member map where you can find a book club near you, then message them to see if they are accepting new members.” Existing book clubs that join TBCN can post their book club page at the site for others to see, share their latest featured book, put up pictures of their members and meetings. Like free books? Nora says, “We’ve been giving away about 100 books a month and for our birthday bash it’s going to be 10 books every day throughout the month of August.” To get more details, go to their site. Thanks, Nora, for giving us the inside scoop on TBCN. I hope a number of my readers will join the group. How about you? What’s your opinion of book clubs? Tell us about the book club of which you’re a member. Authors, how about the clubs with which you’ve met? I’d love to hear. I frequently re-read some of my favorite novels, especially during a time when I'm formulating plots for my books. I don't plagiarize, but rather I try to get inspiration for the tone I want to convey. For instance, if I want to add a lighter touch, I read one of the Spenser novels by the late Robert B. Parker. If I want something tough and hard-boiled, there's no better source than Jack Reacher, hero of Lee Child's series. I was re-reading Worth Dying For, one of my favorite Reacher novels by Child, when I heard the news. There's to be a movie based on the character, and who's going to play the hero? Tom Cruise. Give me a break! 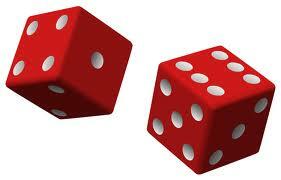 Reacher is six five, two hundred fifty pounds (according to the novel, Tripwire). He usually has a beard that's a couple of days old, and is long past time for his next haircut. His nose has been broken at least three times, and he set it himself the last one (Worth Dying For). He's a straight-ahead, ex-Army MP, as rugged as they come. But Tom Cruise? Nope. 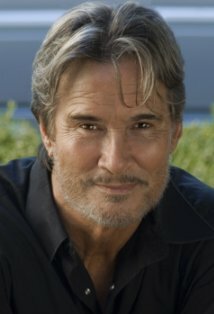 If I see anyone as Reacher, it's someone like Richard Norton (pictured), and at that he's probably too good-looking. That's both the problem and the opportunity for writers of novels. We can describe our characters in great detail or sketchily--the late Donald Westlake said his protagonist, John Dortmunder, had "hair-colored hair." You fill in the blanks. But once a reader gets that mental picture, that's what the character should look like. And in my mind, Tom Cruise will never be Reacher. Do you have problems when you see a movie adaptation of a novel you've liked, and the characters look nothing like what you pictured? Chime in. I'd love to hear from you. Writing: What Chance Do I Have? I'm a member of International Thriller Writers, and every month I received an online newsletter that lists, among other things, forthcoming new releases by members. Whether they are by well-known authors such as Lee Child or debut novels by relative unknowns, still each title on that list represents competition for the attention (and the dollars) of potential readers. In the past month's newsletter, I counted forty new hardcover titles and fifteen e-books that will be launched in July. If my simplified math is correct, the one or two books of mine released in a calendar year have to compete with over five hundred books of a similar genre. And that's just ITW authors. I recently found some notes from a Christian writer's conference I attended about five years ago. Like all the others in the mentoring class I attended, I had never had a word of Christian fiction published. And when I heard that only a small percentage of the attendees at the conference would ever achieve that status, my heart sank. What chance did I have? Some of you know my story. My work was turned down more times than a Holiday Inn bedspread. I wrote four books over four years and garnered forty rejections. 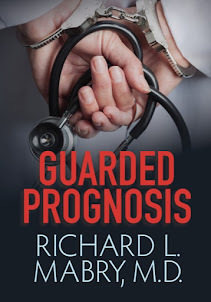 Nevertheless, through a set of circumstances that can only be called a "God thing," I got representation by a new agent, received my first contract, and now have four novels of medical suspense in print with a contract for three more. What chance did I have? Not much. But if I quit, I had no chance. So I didn't quit (although God sort of had to drag me back into writing). How about you? Are you about to give up? Maybe you should think about it again. Want to share? This was a busy week for writers of Christian fiction. 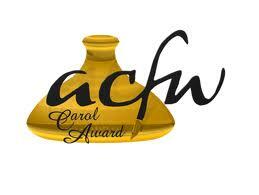 On Monday morning, the finalists for the ACFW Carol Award (formerly Book of the Year) were announced. You can find that list here. That night, at the International Christian Retail Show, the winners of the Christy Award were revealed. Here's the list of winners and finalists. In case you are curious about how Christy winners are chosen, the committee explains it this way: "Publishers submit novels copyrighted in the year preceding the award in one of nine categories. Each category is read by a panel of 7 judges who evaluate each novel against a 10 point criteria." The Carols work about the same way, except that both authors and publishers may submit their work. My congratulations to all my friends who made either (and in some cases, both) these lists. Authors don't necessarily write to win awards, but it's nice when they come along. I've been fortunate enough to receive some myself. Was I proud of the awards? Absolutely. Am I jealous that friends of mine received honors this year? Not at all. Because as Christian novelists, we write for one reasons--to glorify God. Doing that is reward enough. What about you? Are there rewards for which you strive? Do awards matter? We've had our flag up outside our house since before Memorial Day. Because the street light in front of our home provides night-time illumination, we can fly the flag 24 hours a day. We kept it up through July 4, and I plan to have it flying through the rest of the summer, into the fall, at least until Election Day. Sure, our country has lots wrong with it. But at least we're free to express our opinion about what we like and don't like, without worrying about a knock on the door at 2 AM before being carted away to prison. I'll complain as I write the check for my taxes, but I'm free to voice those complaints. If I don't like what a political office-holder is doing, I'll let the world know, and I'll cast a vote to change that when the time comes. As the song goes, "I'm proud to be an American, where at least I know I'm free..." I'm continuing to fly my flag, because--despite some rather significant blots on its reputation in the past few decades--I'm proud of my country. 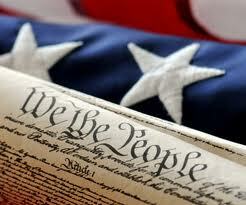 May God bless America. Last week I shared the front cover of my next book, Stress Test, with you. This week let's consider the back cover. Go on, admit it, you rarely even look at the back cover of a book. If the front cover catches your attention, whether the name of the author or the cover design, you pick it up (or click on it) and look inside. That having been said, a significant amount of work goes into choosing the back cover content. I haven't worked yet with Thomas Nelson on this aspect of publishing, but for all my previous books I furnished a few paragraphs, plus a picture of myself and a brief biography. They put this together with some quotes from pre-release reviews and formulated a back cover. Dr. Matt Newman thought he was leaving his life in private practice for a better one in academic medicine. His kidnappers have no such plans for him. They just want him dead. Bound, in the trunk of his car, Matt’s only thought is escape. He does so, but at a price: a head injury that lands him in the ICU, where he awakens to find he’s charged with murder. 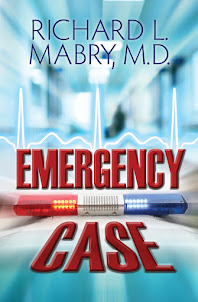 Sandra Murray is a fiery, redheaded lawyer who swore she was done with doctors, but the call from Matt presented a challenge she couldn’t turn down. She decided to give it one more chance. Matt’s career is going down the drain. His freedom and perhaps his life may be next. Can he and Sandra uncover the truth before the kidnappers finish the job they started? So there you have it. That's what goes into a back cover. The next time you're considering a book, will you look at the back cover? Why, or why not? I'd love to know. We're almost at the middle of July, so it's time to ask the question that we always had to write an essay on when we got back to school in the fall--what did you do on your summer vacation? Some of you have already taken your vacation, some are looking forward to it, and some will--for one reason or another--not go anywhere this summer. I've been working to complete the edits on my next novel, while writing the first draft of the one to follow. In between, Kay and I took four days in San Diego to rest, relax, unwind, and...oh, yes...see the Texas Rangers play three game against the San Diego Padres. We were celebrating our birthdays, which come within ten days of each other (and which have both passed, so don't worry about not sending a card). 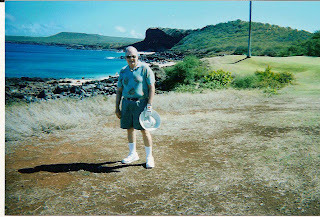 The picture above was taken a couple of years ago when my friend, golf partner, and attorney (in that order) and I were in Molokai, where we managed to get in a round of golf pretty much every day. But that's another story. What did you do/will you do on your summer vacation? Or will you be working through the summer? Any recreational plans for the near future? Inquiring minds want to know. I've shared some thoughts on various aspects of writing, but we haven't discussed book covers. Several questions arise in this regard. How are covers designed? Does the author have input? Do book covers sell books? This isn't the way it works everywhere, but here's a composite of the major steps in the process. Design begins with the author filling out an information sheet about the physical description of major characters and the important central themes of the book. Graphic artists then take this material and, often in consultation with the marketing wing of the publisher, come up with several versions of a cover. Authors may or may not have input here--I have in some instances, not in others. Eventually, a version is settled on as the final product. If the author hasn't seen it already, this is when it's revealed to them. Of course, if the author has serious misgivings, they may ask their agent to step in and talk with the editor about it. But generally the publisher gets it right. That's the front cover. The back cover copy has to be formulated, and we probably should save that discussion for another post. But, believe me, some work goes into it, as well. 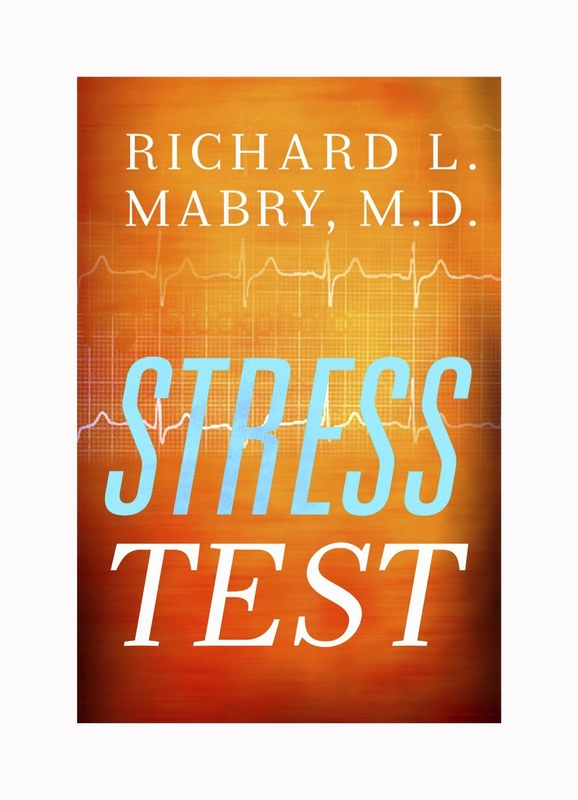 I'm proud to share with you the cover design for my next novel, Stress Test. It's my first to be published by Thomas Nelson, and I'm under contract for more. Stress Test is already available on at least one site for pre-order, for those of you who like to make sure you don't miss anything. Otherwise, it's due to be in stores by the end of March, 2013, with an official launch date of April 1. (Yes, I'm aware of the significance of the date, and wonder if my publisher thought it appropriate for a book of mine). As for whether book covers sell books, that's a question for you. What do you think? I posted this last year, but in view of recent events, it seems more appropriate than ever. 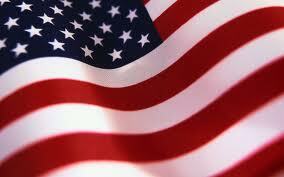 God bless America. Have a wonderful holiday.